Happiness. Joy. Nostalgia. A whole range of emotions well up in me when I see this photo. We all look so happy and that’s how I remember Christmases when I was little. Mum and Dad made all our childhood Christmases wonderful. I remember sitting with them in the evening; the big light would be switched off and the coloured tree lights would twinkle and look magical to me. The way the light glinted off the baubles was so pretty. There was a certain smell too. We never had a real tree and when Mum would open the box to get the tree out, there would be a plasticy, dusty sort of smell which sounds horrible but wasn’t at all! My stomach would start to clench with excitement as the garlands and balloons went up. It would bubble up bigger and bigger in my belly until I thought I’d burst with every new bauble Mum unwrapped. I’d try to stifle little giggles that were doing their best to escape the more excited I got. We stored the baubles and tinsel in an old chest which also had it’s own Christmas smell and I loved watching Mum unwrap each bauble from the toilet roll she’d carefully wrapped them in when she’d taken them down the previous January. The garlands weren’t shiny foil ones like we have now. We had paper ones, you can just see them in the photo. I’d forgotten all about them. We had the crepe paper ones that you twisted as you stretched them round the room and the ones that opened up into bell and star shapes. We always had balloons and mistletoe, which I think hung above the door. Dad would kiss Mum if they passed under it at the same time. It would make me smile when I saw him pass under it on purpose so he could grab a kiss. He’d look at me and wink and I’d giggle at him. Mum would protest and say, ‘gerroff you soft sod’ but she’d be smiling and I knew she liked it as much as Dad! I seem to remember the tree being up on a sideboard and having sweets and chocolates under it but I could be mixing up memories of later Christmases in our next house. Mum had a glass trolley that she put drinks and snacks on, like mixed nuts in shells, chocolate (Cadbury’s Roses were a must!) and salted peanuts. Dad would let me have a sip of his snowball and when I was a little bigger, he’d make me one of my own. I felt all grown up and even now, we have to have snowballs at Christmas. 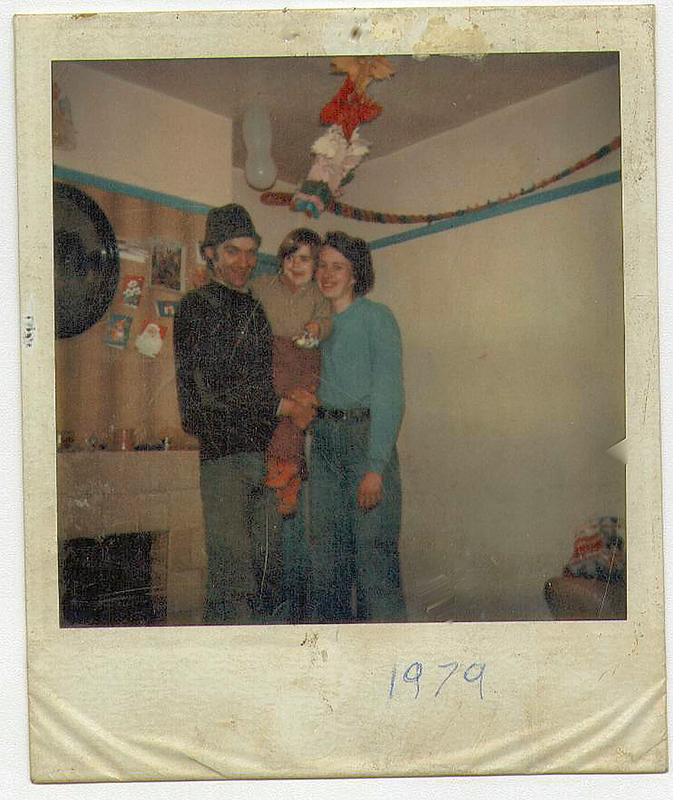 We didn’t always have much money but we always had a huge pile of presents. When I was older, my brothers, sister and I would sleep in the same bedroom on Christmas Eve and when the first one woke up, they’d wake the rest up. One of us, usually John because I’d make him he offered, would tiptoe downstairs into the living room to see if Santa had been and if he had, we’d go and wake up Dad. Most of the time though, we’d find Dad still down there watching T.V. because even though it felt like we’d been in bed all night, it had only been a couple of hours or so! If Dad was still down there and Santa had been, he’d be asleep when we went in and we’d have to wake him up to tell him. He’d be all surprised that he’d slept through Santa’s visit! As long as Santa had been, Dad would never send us back to bed, even though it wasn’t unusual for us to get up at 3.30am or earlier. Mum would have pork pie, bread and butter and branston pickle (can’t remember if she had anything else with it) for breakfast because that’s what she had when she was little. I have to admit, that’s one tradition I didn’t really take too. Not because I don’t like pork pie and pickle, but because I was usually too full of chocolate! Mum would then be in and out all morning cooking the dinner while Dad played with us and after dinner, Dad would fall asleep for a couple of hours on the sofa! In the afternoon, we’d get more presents from Grandparents, aunts and uncles who came to visit. Silly Santa always got confused and left some of our presents at Nan-Nan’s. The T.V. would be on all day and we’d watch Mary Poppins and all the other movies they played every year! Christmas is still my most favourite time of the year. Once September comes around and the kids are back at school, I start my Christmas planning. I have the drinks trolley now that Mum had when I was little; it belonged to my Mama before she gave it to my Mum so it’s very special to me. When the trolley comes out and gets filled with goodies, (Advocaat, lime cordial, lemonade, Baileys, Cadbury’s Roses , mixed nuts in shells, dry roasted peanuts, salted peanuts) we know it’s officially Christmas in our house. I started a new tradition when Aiden was born. He was born in 2000 so I bought him a wooden teddy tree decoration that has 2000 printed on it’s tummy. I’ve bought him and the girls a different one every year since they’ve been born. I thought it would be lovely for them to decorate their own trees with decorations from their childhood when they get their own homes. I wonder if Mum knows how much I appreciate her giving me the trolley and how much it means to me to bring it out every year? This year, I’ll let her know how special she made Christmas for us and how her traditions have stayed with me. Because of the warm fuzzy feelings I get when I think back to my Christmases, I try extra specially hard every year to make Christmas magical for my kids. I hope seeing the trolley being filled with goodies each year will bring back special childhood memories for my three when they’re grown and have families of their own.